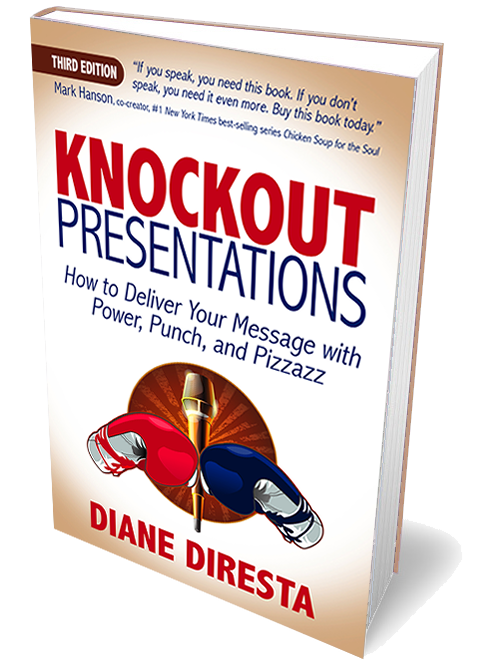 Knockout Presentations Revised Edition — DiResta Communication Inc.
Life is a presentation. Is your presentation holding you back? The ability to present your ideas is quickly becoming a “must have” business and professional skill. Whether your platform is the boardroom or the kitchen table, Knockout Presentations will show you how to dazzle them on the platform and knock out the competition. This best selling public speaking book takes a simple, step-by-step approach to presentations so that anybody can learn and apply the secrets of successful speakers. The interactive exercises provide specific techniques to control nervousness, prepare your presentation, and sell your message. You will learn to present a clear, concise, and confident message. This is the one public speaking book that shows you exactly how to do it. You’ll put the skills into practice and become accountable for being a good listener. Knockout Presentations is a brilliant, confidence-building and reassuring book. This is a book I go back and refer to at different times for different purposes – a real reference book.